The premises of the Rye Art Gallery have been described as being like a Tardis (you need to be familiar with Dr Who) and there is certainly something in this description. A small relatively modest facade conceals a cavernous interior made possible by occupying two adjoining back-to-back buildings and extending over three floors and all displaying the talents of artists, both home-grown and from further afield. And it is not just paintings, but pottery, sculpture, objets d’art, jewelry and more. There were contemporary artists, too. 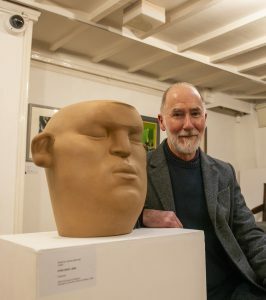 Anthony Bennett was there in person with his sculpture ‘Eyes Shut’ – a piece that regular visitors to the gallery will have seen before, and the promotional image for the show was Fairlight by local artist Ken Townsend who, although no longer with us, passed away only in 2001. A further local artist was Kitty French, yet another character it would seem (but then Rye has always been full of characters). 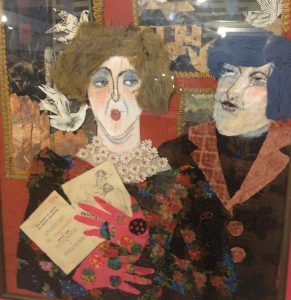 Sadly dying at the comparatively young age of 64 in 1989 she was not just an artist but an inspirational teacher who also loved a good party. 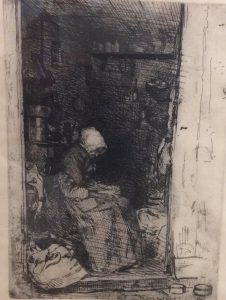 Her humour particularly comes to the fore in a collage entitled ‘Private view’. Produced in 1970 the characters depicted hold their invitation which is addressed to the “Sneerwells”. But this is just to scratch the surface of an exhibition that was the idea of Louise Simkiss, the education manager of East Sussex WEA (Workers Education Association) with the exhibits being chosen by WEA art students at the Jerwood Gallery in Hastings and working in conjunction with Rye Art Gallery as a Community Curated style project and learning experience. Whatever is origins, however, this is a fascinating exhibition: a truly eclectic collection displayed to advantage in the Stormont Studios on the top floor of the Art Gallery. 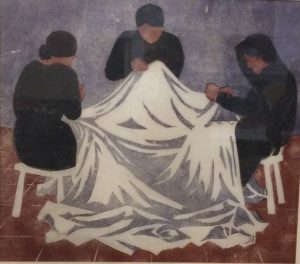 With over 700 pieces in the permanent collection to choose from, the students finally came up with the themes of ‘Women collecting’, ‘Women at work’, ‘Local Heroes’ ‘Surprising masterpieces’ and ‘contemporary landscapes’. One final word for those who have not been to Rye Art Gallery yet: this is not one of those intimidating galleries where you are expected to be an expert in the items on display, but a collection of smallish – almost cosey – rooms and staffed by knowledgeable assistants for whom no question asked is a silly one. If you haven’t been (or even if you have), do go. Entrance is free and Re: Collection is on from now until February 24. It is open 7 days a week, Monday – Saturday 10:30am to 5pm and Sunday 11am to 4pm. Image Credits: Peter Wiles, John Minter. The editor of Rye News is a well-known fan of Britpop, and he clearly must’ve been listening to Pulp on his Beats Solo 3 Wireless headphones whilst writing up his piece, since he talks about the Jervis Gallery. 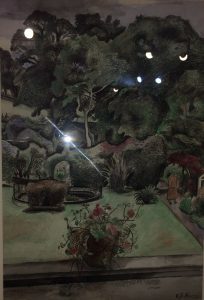 Jarvis Cocker, of course, wrote the brilliant Common People, while the Jerwood Gallery in Hastings provided the fab paintings! Oh dear, Andy Stuart is, of course, quite right and I should have said Jerwood and not Jervis Gallery. This has been corrected and my apologies to the Jerwood. However, being more a student of history (particularly maritime) rather than a fan of BritPop, I fear that Jarvis Cocker would have been very much second place in my mind to another two Jervis’s – possibly Admiral Sir John Jervis whose British fleet knocked seven bells out of the Spanish at the battle of Cape St Vincent in 1797, or perhaps I was thinking of the armed merchantman, HMS Jervis Bay, out-gunned and sunk by the German pocket battleship, Admiral Scheer while gallantly defending a convoy in 1940. Her commanding officer, Captain Fegen, was subsequently awarded a posthumous Victoria Cross. Nothing wrong with listening to Pulp of course and yes you are right Jerwood gallery was a typo. 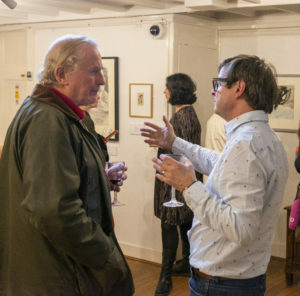 Also just to confirm all the work exhibited in this exhibition is actually from Rye Art Galleries permanent collection – The art education group of WEA are taught by Louise Simkiss Day they selected the work from our exhibition catalogue of 700 art objects but for their studies they are based at The Jerwood. 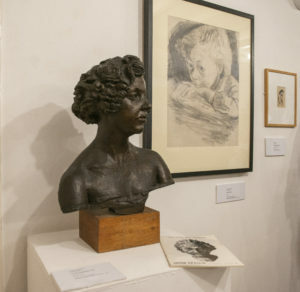 The photograph of the ceramic ‘Eyes Shut’ shows the artist as well as the sculpture. He is Tony Bennett not, as credited, Ken Townsend. Tony often exhibits work for sale at Rye Art Gallery and has ceramic pieces in collections all over the world. This is one of two Heads held in the RAG Collection, the other being ‘Eyes Open’. I think there is some confusion here Fanny. The article does say that the sculpture was by Anthony Bennet and that the painting at the beginning of the article is by Ken Townsend, a painting which I love. Hello Gill – it’s the photograph of the ceramic that should credit Tony who is shown alongside. Hello Fanny yes I do see what you mean it is rather confusing. Nice link here between Rye Art Gallery and admirals! Most will not know that one of my predecessors as Chair Trustees was Admiral Sir John Frewen (to early 1970s), who had command of the Home Navy in the latter part of his career. I am sure that he would agree with Julian Day that it is indeed a “lovely gallery”. It is good to see the present day beneficiaries appreciating both Mary Stormount’s legacy and the way it was enhanced in the noughties! While the editor is possibly a passionate relic from the New Romantics period, I am sure that today, St Valentine’s Day, he will instead be celebrating the great victory of the English Fleet, lead by his hero Admiral Sir John Jervis, at the Battle of Cape St Vincent in 1797 against the much larger Spanish Fleet!